If you are looking for things to do in Sault Ste. Marie, come to The Antlers. The Antlers is a legendary landmark across from the south-end of the Soo Locks, serving Northern Cuisine at lunch and dinner with a great family atmosphere. 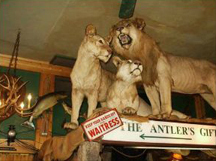 We serve Northern Michigan Cuisine and have a rustic atmosphere with over 200 animal mounts everywhere in the restaurant. The majority of the food is homemade. Â©Â 2013: The Antlers Restaurant | Things To Do In Sault Ste. Marie | All rights reserved. If you're planning a rehearsal dinner, party, reunion, or other special celebration, we would love to have you in our large banquet room. We host cocktail parties, cookouts, and receptions, as well as board meetings and business gatherings. Our Group Menu is large and can be tailored to customers needs. Call today to find out more about our catering and banquet service in Sault Ste. Marie! Only good til it is gone!